It took 129 days to record, between autumn 1966 and spring 1967, and it changed the world. Sgt Pepper’s Lonely Hearts Club Band may have all but disappeared under an avalanche of hyperbole, but if there’s one reason why this album stands the test of time it’s because its sum is greater than its whole. After five listens most people will know it as a suite, where Lucy in the Sky with Diamonds always follows With a Little Help from My Friends. And it will always be thus. The reason it took 129 days to piece together isn’t due to the band’s indulgences – on the contrary, The Beatles were extremely disciplined during their studio sessions. It’s simply because guiding an album this complex to fruition in those days took a long time. These guys weren’t just recording songs; they were inventing the stuff with which to make this record as they went along. But with George Martin and his backroom boys on hand, the Faberge psychedelic egg that was finally laid on the eve of the Summer of Love came so fully-realised that it changed the way we listened to recorded sound forever. 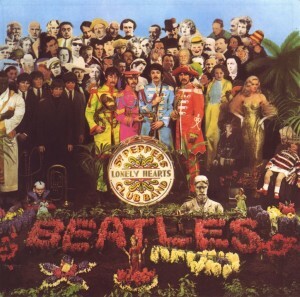 Sgt Pepper’s… is at once warm and familiar, yet wild and strange; cosy and English with a very empirical eye on the exotica of the East (note George Harrison’s underrated Within You Without You). Shot through with Peter Blake-assisted Edwardiana, it was also as fashionable as it could possibly be. It was also a release key in the canon of concept albums, coming with its own alter-ego mythology and very much addressing the pressing concerns of their generation, ie: how to achieve higher states of consciousness in 60s suburbia. It is riddled with The Beatles’ trademark love/hate affair with the Establishment as their own lives were suddenly shoved unceremoniously up against those of the chattering classes, encapsulated by She’s Leaving Home’s blow at straight parenthood, Lovely Rita’s suggestion of sexual deviancy, and A Day in the Life’s oblique references to minds being blown on buses in rush hour traffic. Yet it’s all a far cry from the militancy of their American peers. Paul McCartney’s When I’m 64 is pure nostalgia for his parents’ golden age, one which was taken from them. It’s less a kicking out of the jams, more a spreading them on scones at teatime. Yet what was revolutionary was the sonic carpet that enveloped the ears and sent the listener spinning into other realms. There was the nursery rhyme surrealism of Lucy in the Sky…, the crazed calliopes of Being for the Benefit of Mr Kite! and, of course, the lysergic collage of A Day in the Life, promising the meaning of life in its endless final chord. And it still rings on today.